As my description of my self-designed MBA internship faded into the walls, a pregnant pause filled the room. And as I looked at Professor Pitts-Wiley’s giant and gentle face, I saw a thoughtful grimace appear, and spread across the surface of his vast dome to include his prodigious ears, his salt-and-pepper mustache, and the whites of his heavy, purposeful eyes. And as that moment gave way the Professor leaned his massive torso onto a black-lacquered desk, set his large brown eyes on mine and posed, gravely: Are you on a journey? Or are you wandering? A journey, he would go on to explain, has purpose, whereas wandering does not. It’s been four months since my meeting in Professor Pitts-Wiley’s office in April, the same month that I decided that I was going to create my own summer internship as a storyteller. And in that time I feel that I’ve learned a lot about my purpose. From coffee chats with designers to interviews with retirees in New Mexico, I’ve found that my passion lies in what I call “performance ethnography.” I define performance ethnography as the act of extracting stories from my environment, through interviews and observation, and sharing them with others in a compelling way, through film and public speaking. And yet I have my moments of self-doubt. As I face the coming year I’m struggling with basic questions: do I practice performance by continuing my stand-up comedy or by being the spokesmen for a social movement? Do I practice ethnography through self-funded interviews or within the context of a private company? And even more pressing, as I read an invite for a welcome-back party on campus, how does my MBA education serve my passion? As I struggle with these questions at the tail end of my summer internship, I think to advice that my sister once gave me: make your decisions from a place of confidence, not fear. And as I visualize my career in performance ethnography in front of me, one thing that is clear is that the most purposeful path leads through a period of practice, of creating content, and of immersing myself in its form. And so in the following year I will take a leave of absence from MIT Sloan and delve into my craft. And as I find a part time job to finance my creative ambitions and create a community of similarly inspired folks, I feel nervous, but also confident. Confident that I’m one step closer to the moment when I can lean in over that black-lacquer desk, look Professor Pitts-Wiley squarely in the eyes, and reply with all of the conviction in the world: I’m on a journey. I have yet to meet a person who has thought more deeply about how story is constructed than Barbara Barry. A former PhD student at the MIT Media Lab, Barbara’s research focused on developing systems that can understand story and assist in its creation. Building such a system, it turns out, is really really hard. Take the sentence, “She ran down the street with a wet cat in her arms.” When a person hears this they know, intuitively, that a dramatic event is unfolding. They imagine the scared, cold cat digging its claws deeply into the woman’s hand. They imagine the women, running from or towards something with a sense of urgency. A machine, on the other hand, will have great difficulty extrapolating such storylines. Barbara has done extensive work on tackling this problem by creating storytelling platforms that draw on paradigms in artificial intelligence, psychology and the archetypes of story. – A decision engine built into a videocamera that asks you what scene you wish to film (say a birthday party), and then suggests a potential shotlist (birthday cake, candles, presents, balloons, etc). This system could also analyze your previous shots and suggest what shots to take to make the story more compelling. – A custom documentary builder that allows you to pick an event (say Election Night 2008), a subject (say the 2nd generation Cuban diaspora), and then automatically outputs a powerful, compelling video on the story of (in this example) the Cuban disapora during the Obama/McCain election. – A healthcare platform that develops a customized narrative that can soothe a patient who is in pain or feeling anxious. This is based on the premise that A: not everyone relates the same way to the same stories (e.g. to imagine floating in the sky would be scary to someone with a fear of heights); and B: story and narrative can have a real impact on managing physical stresses. – On understanding compelling story structure: Robert McKee, screenwriting instructor whose former students have won 26 Academy Awards and 125 Emmys. – On the concept of conceptual dependency: Roger Schank, who developed a markup language based on the principle that verbs of all languages can be expressed using a small number of primitives. – On Story at MIT: The Common Sense Computing Initiative is studying how to use story and narrative as a tool for problem-solving. I’ve heard from several folks about the power of storytelling, but my meeting with Barbara left me in awe of both the complexity of story and its influence on fields ranging from healthcare to problem-solving. One of the things I cherish most about MIT is its openness and irreverence. Today was no exception, when the MIT Club of Boston hosted a super energetic, diverse poetry slam on campus. Some of the performances were funny, others were musical, and a few — performed by recovering drug addicts and former prisoners — were gripping. Lately I’ve had some great brainstorms on how to frame my storytelling project this summer. My friends, sis, and I have come up with a list of eight ideas that I’m excited about and, the longer I sit with this list the more excited I feel about one idea in particular. The question that I want to answer is: Why will people be excited to move to Los Angeles in 10 years? In an era where Hollywood has been killed by distributed content creation and distribution (a la YouTube), where foreign investors are no longer pouring money into skyscrapers in Los Angeles (but rather new megacities in the Far East), where Americans are immigrating abroad for blue collar jobs, why will people still pack up their lives and move, with excitement and purpose, to the city of Los Angeles? What is it about LA’s DNA, its lifeblood, that will continue to draw both fresh immigrants and tourists? What are the immutable, timeless values that can be found in LA and nowhere else? I like this question because it’s one that I’m genuinely curious about, and it’s one that I feel that Los Angeles, and America more broadly, will really have to grapple with if (when?) it’s overtaken, economically, culturally, and militarily, by the rising tigers of the Far East. Other former superpowers — take France for example — have gone through this introspective process (arguably after WW2), and have done a pretty good job at finding their core values (or articulating their story). Over 80 million tourists go to France annually (more than the country’s population!) to fall in love with French culture — that timeless, unique, immutable set of values that can only be found in the alleyways, boulevards, parks, and art galleries of France. So why will people come to Los Angeles when its skyline is unimpressive, its economy is stagnant, and its cultural impact is negligible? What are LA’s other assets that fill a big hole in the hearts of its residents, many of whom may not be interested in Hollywood, or a glam lifestyle, or may have better job prospects elsewhere, but stay in LA because they love the idea of raising their families there? If I can help LA to answer this question, perhaps I can help America to find itself in a world where its economy is second to China’s (or, according to the Wall Street Journal, in 10 years). – Professor Ricardo-Pitts Wiley: “The difference between story — and news — is how deeply the person is invested in sharing it.” What I like about this story is that I feel that most residents of Los Angeles (those who plan to stay there indefinitely) have a vested interest in sharing it. This is potentially powerful. – If I do tell this story, I’d love to integrate it into my cross-country drive to Los Angeles. One idea is to ask for peoples’ (say a farm-hand in Kansas) opinion’s on Los Angeles. Perhaps people outside of LA have an easier time articulating why it’s a great city than those who live in it. – As I think of this story, I’m often brought back to the “Lose Yourself in Melbourne” commercial presented in my marketing class by Professor Ritson. Earlier this afternoon, in the heart of MIT’s campus, I joined 40 members of the MIT Arab Students Organization and their friends and consumed story in an oral tradition that runs deeply in our shared ancestry. Omar Offendum, a Syrian-American with a talent for hip-hop and spoken word took us on a journey through the streets of Syria, as well as the unique liminal space that he resides in between his ethnic motherland (Syria) and his childhood home (America). His songs, inspired by the works of Langston Hughes, did an incredible job of conveying the beauty and shared culture that flows through the streets of Damascus. My favorite song of Omar’s was about a “Street Called Straight,” or a street in Damascus that’s purported to be the longest inhabited street in all of civilization. He walked us down it, and as he did so he spoke of the storytellers and shopkeepers that he met along the way, men and women who who represent a modern manifestation of a spirit that is as older than time and unique to Syria. I was excited to find out that Omar is based on Los Angeles, and I hope that we have the opportunity to collaborate this summer. This summer I’ll be heading to Los Angeles to practice storytelling. While not a traditional MBA internship, my friends and faculty at MIT Sloan have been super supportive, often connecting me with whoever they feel will be helpful on my journey. There is, however, one question that always crops up: Why storytelling? And what does this have to do with getting an MBA? The seed for my journey was planted in 2005 when Christopher Adkins, my former professor at William and Mary, invited me to speak to his undergrads about potential career paths. As I thought about what to say, I remembered a recent article that I had read about Shotei Ibata, a Japanese calligrapher. As a young man, Shotei was advised not to go into calligraphy because it was super competitive, and prospects for earning a living were slim. Shotei nevertheless followed his passion, and in the process invented a completely new type of large format calligraphy (i.e. giant circles drawn with a 6 foot brush) that brought him worldwide acclaim and a steady stream of clients. As I relayed Shotei-sensei’s story to the undergrads, there are two lessons that I highlighted: First, passion is a competitive advantage. Second, behind every passion lies a business model (even if your passion is to draw circles). So what is my passion? To answer this question, I sat down at my desk last Fall and I created a matrix. 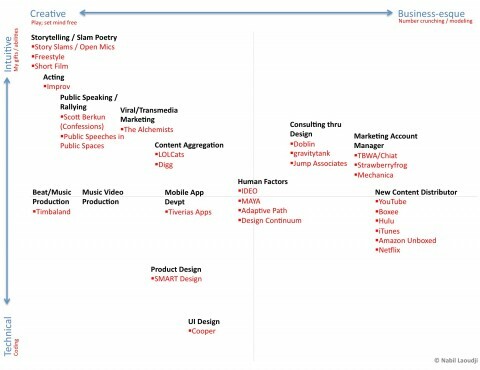 I plotted Creative, Business-Esque, Technical, and Intuitive on opposite ends of the X and Y-axes, respectively. Next, I took a deep breath, told myself to suspend all judgment and awareness of my work experience (e.g. an MBA with a consulting background), and started jotting down activities that I enjoyed. As I looked over my filled out sheet of paper, I felt a wave of joy: all of the opportunities looked exciting. As I mulled over the matrix over the next few days, another realization became clear: the more that the opportunity maxed out on the creative and intuitive ends of the spectrum, the more excited I was about it. The idea with the highest score? Storytelling. And thus my summer plans. So what does storytelling have to do with my MBA? In short: I’m not sure. And that’s okay. In a 2005 commencement address at Stanford, Steve Jobs shared his story about dropping out of college and “dropping in” to activities that piqued his interest. One such activity was a local art class, where Jobs learned how to make beautiful typography. At the time he had no idea how this class would serve him, but as he was designing the Mac — the first computer with beautiful fonts — it all made sense. Jobs said, “It was impossible to connect the dots looking forward when I was in college. But it was very, very clear looking backwards ten years later.” The essence of Jobs’ message is that there’s a lot of value in bringing together unlikely experiences, especially when they’re rooted in genuine interest. With this principle as my basis, I have faith that my storytelling internship will bring value to my MBA. In fact, some of the dots are already starting to connect. So where do we go from here? Currently I’m working to raise funds to cover my expenses this summer, brainstorm potential storytelling frameworks, and build out my network in Los Angeles. If you suggestions on any of these, please drop me a line. Otherwise I will post updates on my new project website — www.mbastoryteller.com — as I continue my journey. Thank you to all of you who have supported me so far.